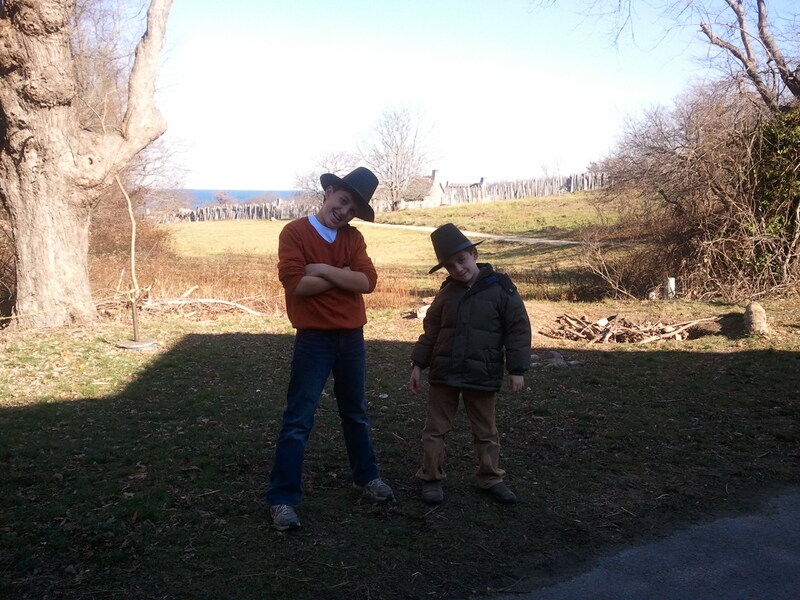 There is no better place to celebrate Thanksgiving than in Plymouth, Massachusetts! After spending time in Plymouth last Thanksgiving, we learned about the Pilgrims struggle to survive and how they influenced our country’s current form of government. It was great way to teach my son and nephew that Thanksgiving is more than drawing turkeys around their fingers, filling up on that once a year cranberry sauce dish and watching football! 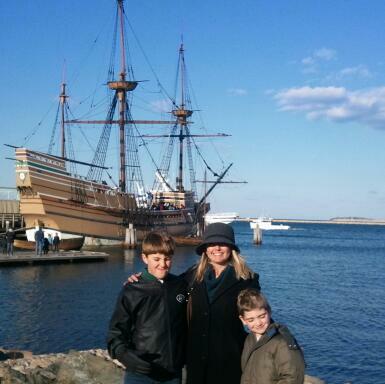 This was such a fun getaway and I am pretty sure the boys will never forget spending Thanksgiving with the Pilgrims! If you are looking for the ultimate Thanksgiving experience, plan to go the weekend before Thanksgiving. On Saturday, Waterfront Park is packed with activities and there is a Thanksgiving Parade. 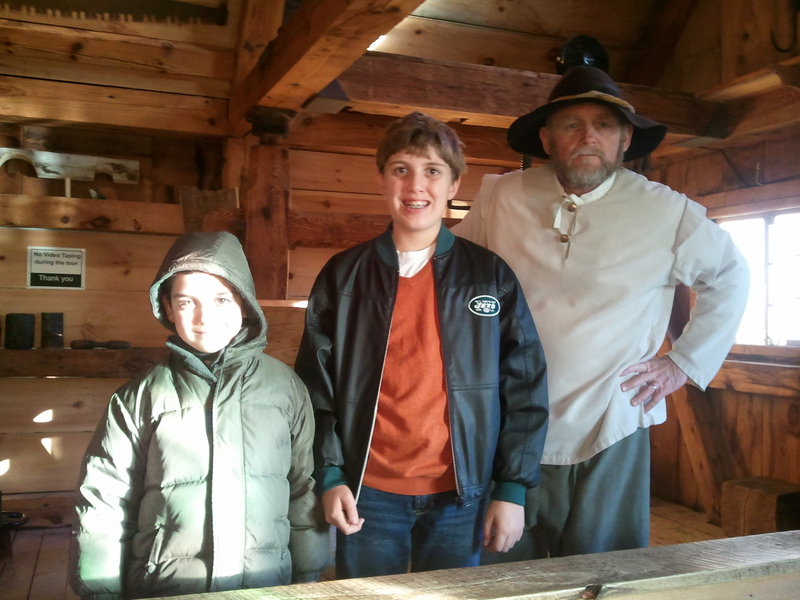 Sunday, Plimoth Plantation holds a Turkey Dinner at Waterfront Park. For more information about the events planned for the Plymouth Thanksgiving Celebration, call 508-746-1818. Here are my additional picks for planning a memorable Thanksgiving! 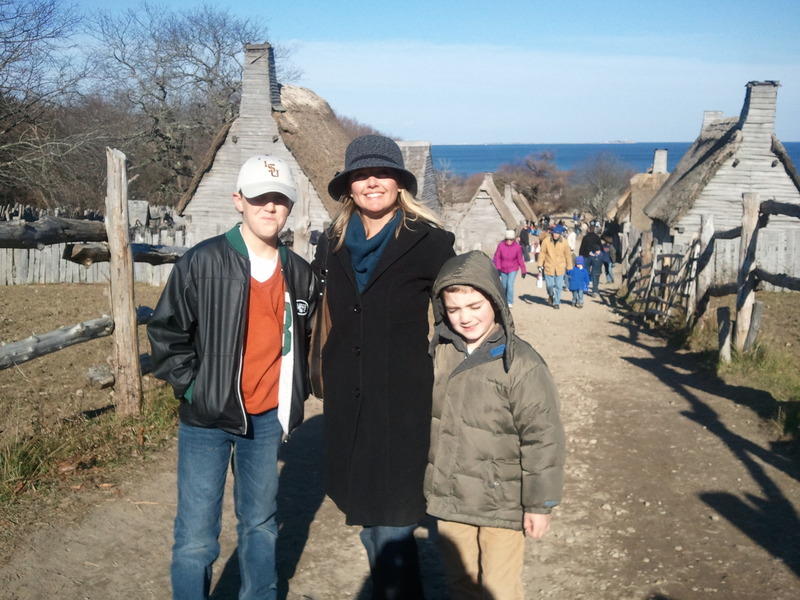 Plimoth Plantation is a histoical living museum. Here you will visit the Wampanoag Homesite and meet the Natives and then travel to the English Village and meet English Colonist. The costumed role players are great! 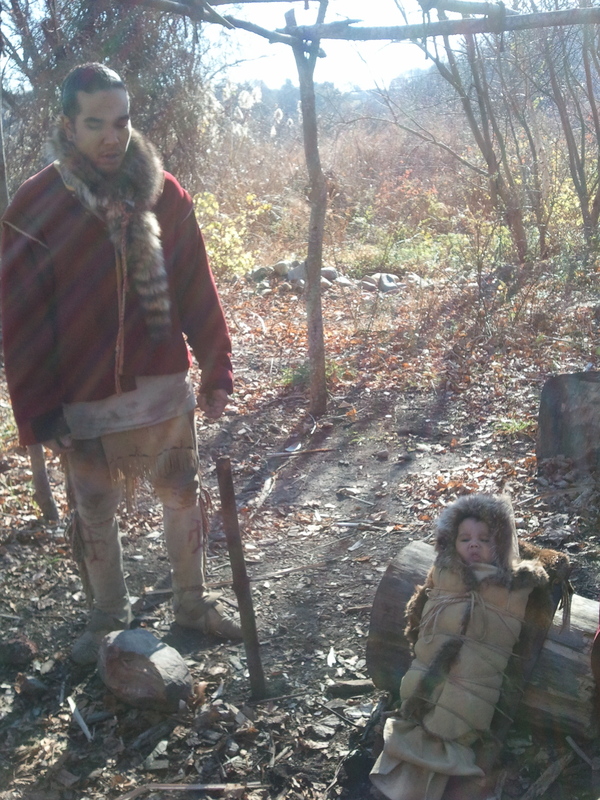 Your family can watch the Natives cook over an open fire and make crafts using the same techniques from 1627. While in the English Village your family will be able to speak with the colonist and take in an amazing view of the Cape Cod Bay. The best deal is the Plimoth Pass for $122.50 which allows 2 adults and up to four children (6-17) admission. This pass can not be purchased on-line and must be purchased at guest services in the visitor center or at the Mayflower II. Mayflower II is a full-scaled reproduction of the original Mayflower . Here your family will be able to learn about the 102 passengers that made the transatlantic journey. The role players do a great job in sharing tales of how life was aboard the ship. 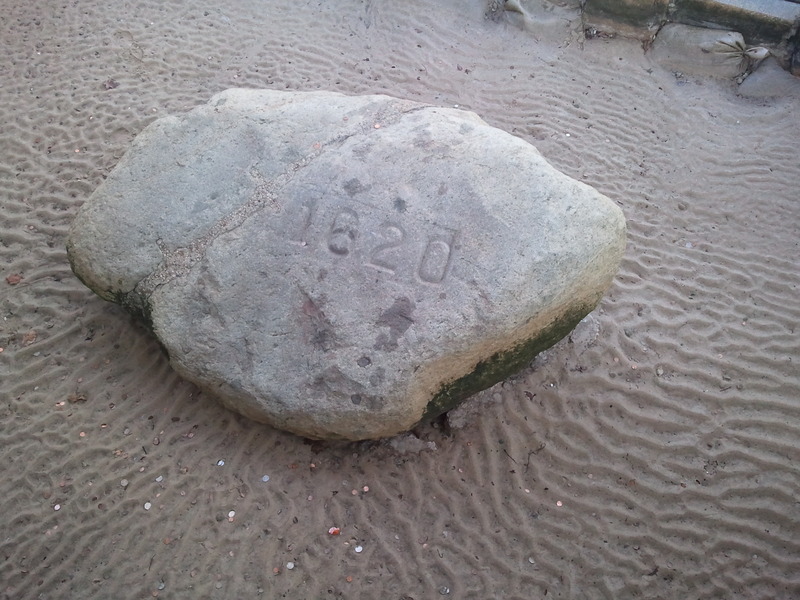 Plymouth Rock is located very close to the replica of the Mayflower. Here on the waterfront you can find the important symbol of American history that you first learned about in elementary school. Jenney Grist Mill was built by Pilgrim John Jenney to meet the needs of the growing Pilgrim population. This was the first mill in America and the beginning of industry in our country. Your family will learn how to grind corn and how it was made into Jonnycakes. Hilton Garden Inn Plymouth – 508-830-0200 or book through hotels.com, my go to site! (If you book through hotels.com, make sure you sign up for their welcome rewards program!) We love staying at Hilton Garden Inns! We stayed for two nights over a holiday weekend for $245! The indoor heated pool, close proximity to attractions, and breakfast at the Great American Grill makes it a great place to stay for families! Halloween is one of those holidays that is fun and entertaining for both kids and parents. 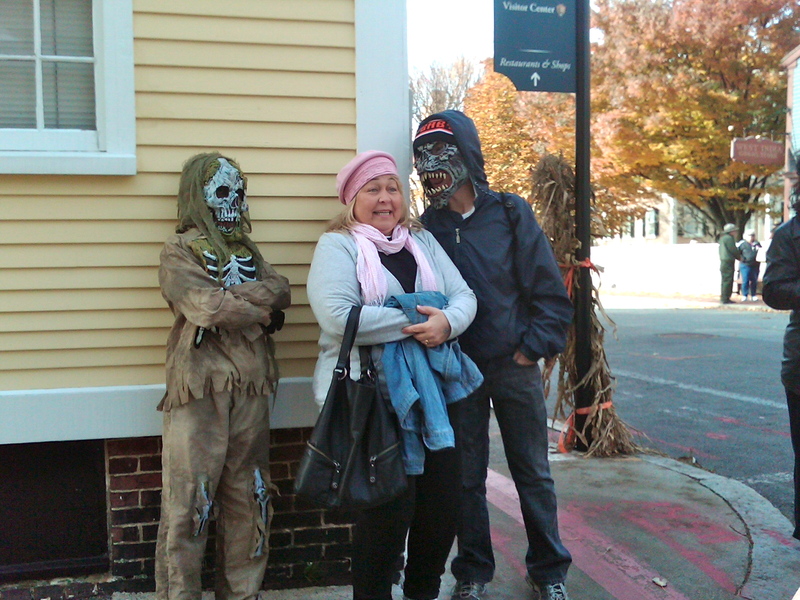 Last year, my son and I experienced one of the best Halloween’s in Salem, Massachusetts. 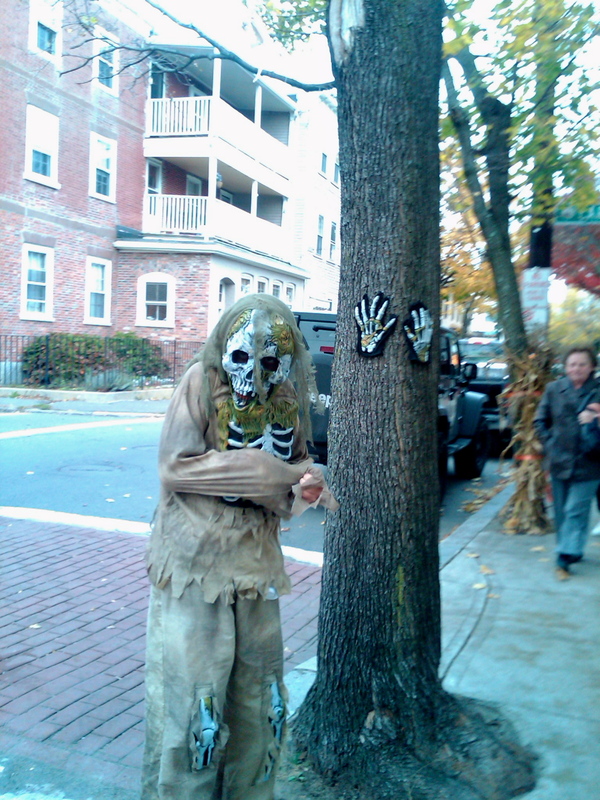 Each year Salem celebrates by hosting Haunted Happenings throughout the month of October. The event known as “America’s Halloween Festival” includes events like walking and trolley tours, psychics and sites like witch museums and haunted houses. We started our weekend in the Haunted Neighborhood on Derby Street. I had purchased a Halloween Pass through SalemWaxMuseum.com online before arriving. 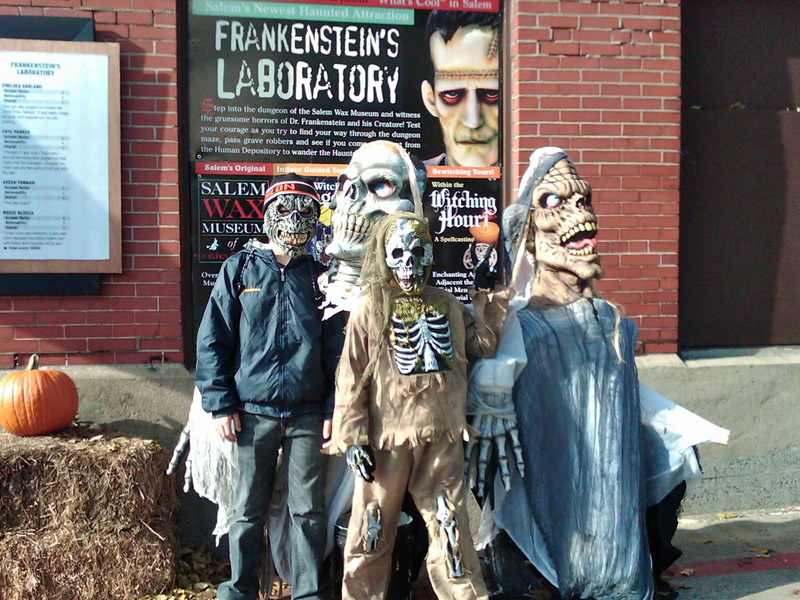 The pass included a cemetery tour, admission to the Salem Wax Museum of Witches and Seafarers and admission to two haunted houses, The Haunted Witch Village and Frankenstein’s Laboratory. 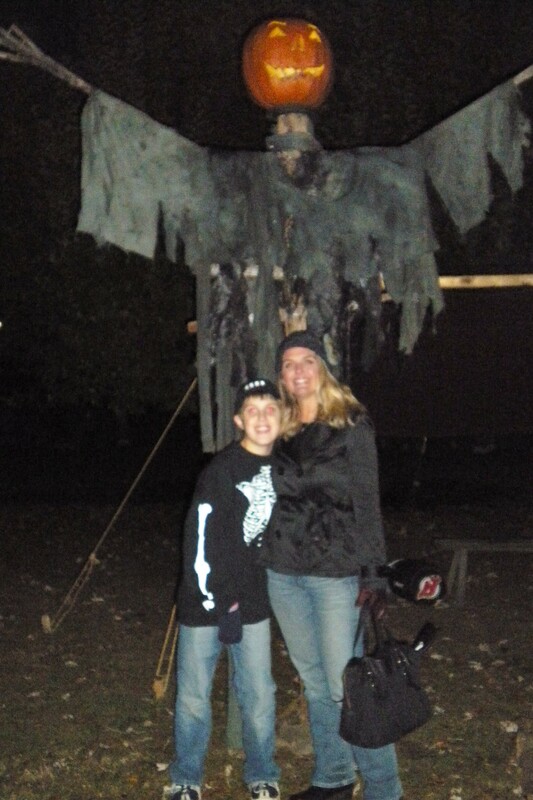 My son and his friend loved the haunted houses and found them frightful. The museum was a disappointment and we went through it in less than fifteen minutes, but we all enjoyed the tour through the cemetery and the Witch Trial Memorial. 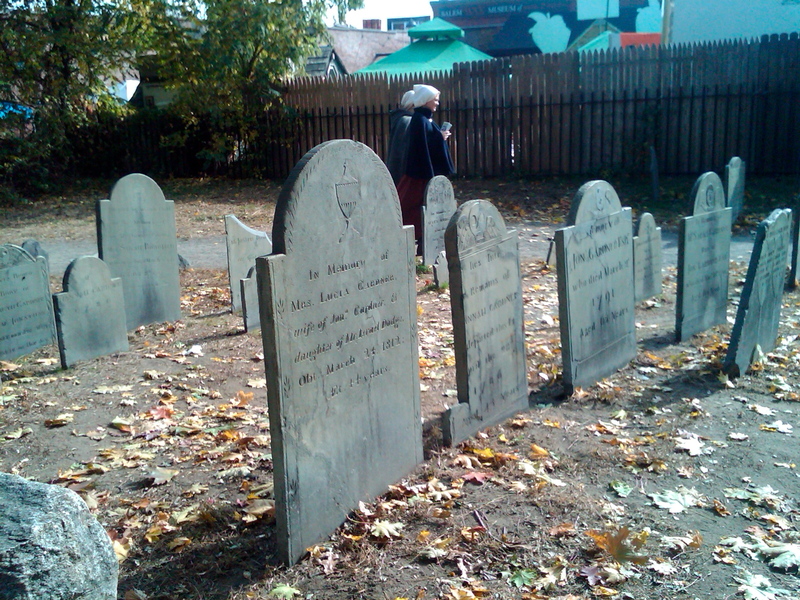 The Burying Point is the oldest burying-ground in Salem. We saw the headstone of John Hathorne who was a judge of the Witchcraft court. He was actually an ancestor of Nathaniel Hawthorne. We learned that Nathaniel Hawthorne actually changed the spelling of his last name, because he didn’t want to be associated with the Salem Witch Trials of 1692. People watching was entertaining in itself! The boys had a great time touring the town in their costumes. A tourist posing with my son and his friend. 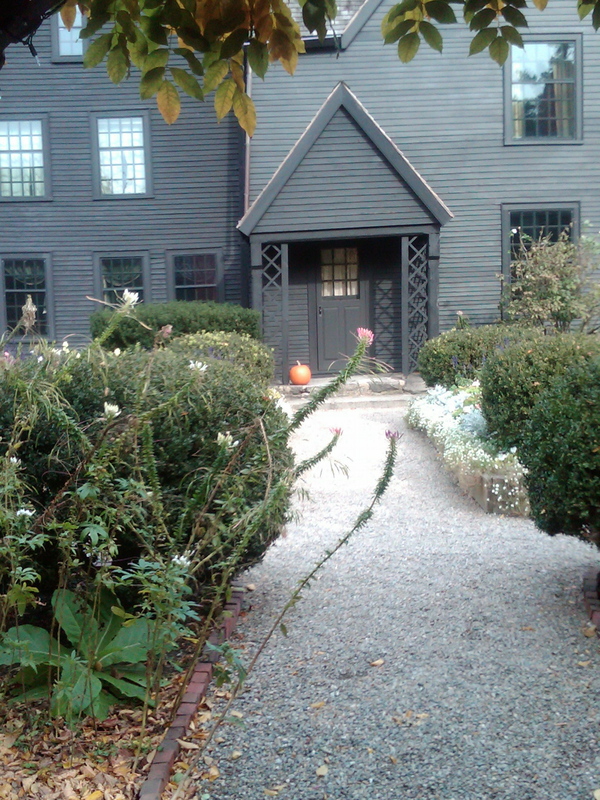 We checked out the stores and places to eat on the way down to the House of Seven Gables. We ended the day at the annual Carnival Fiesta Show where the boys had fun on the rides and playing games. 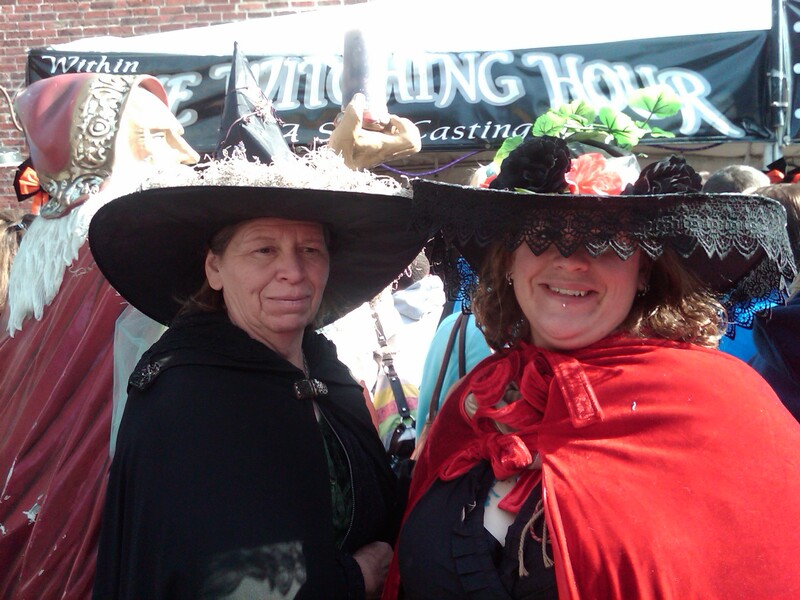 We really had a great time and plan on heading to Salem again. The next time we go, I would love to stay at The Hawthorne Hotel over the last weekend of October and attend the Annual Costume Ball. Of course both the hotel and the costume ball sell out quickly and reservations typically need to be made far in advance. 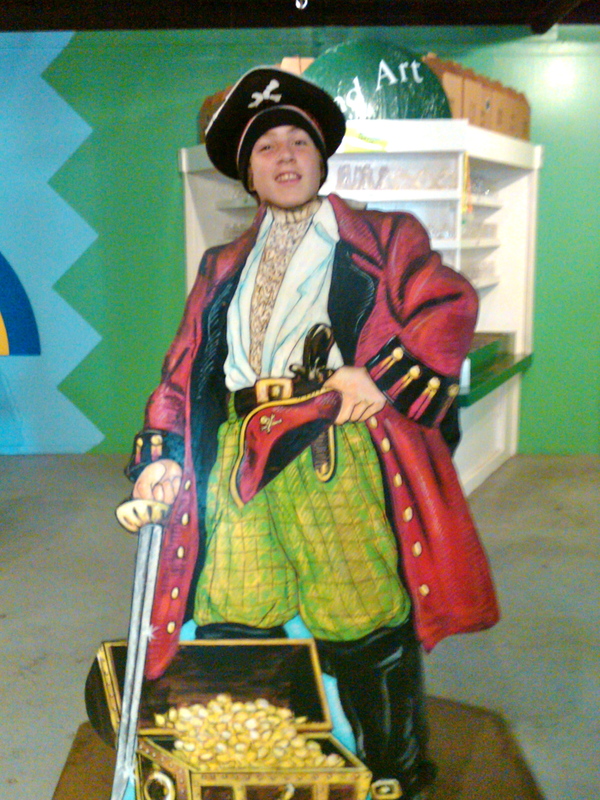 On our next visit to Salem, I would change things up from my visit in 2010, so I plan on starting our visit at the National Park Service Salem Visitor Center. Apparently you can start the Heritage Trail, which is an easy walk along a red line to many of Salem’s attractions. I loved the Freedom Trail in Boston, and this sounds very similar. 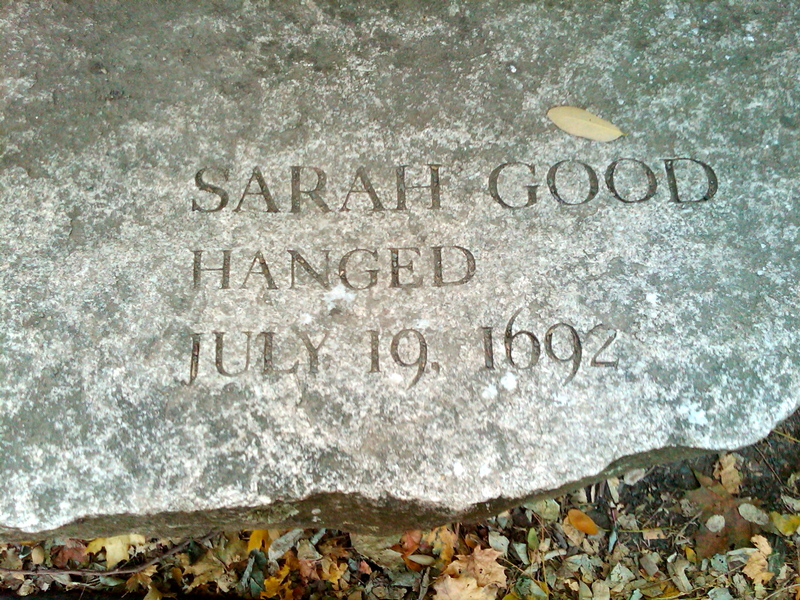 The trail hits highlights like the Witch History Museum , Salem Witch Museum and The Witch Dungeon Museum where there are reenactments of the Salem Witch Trials. 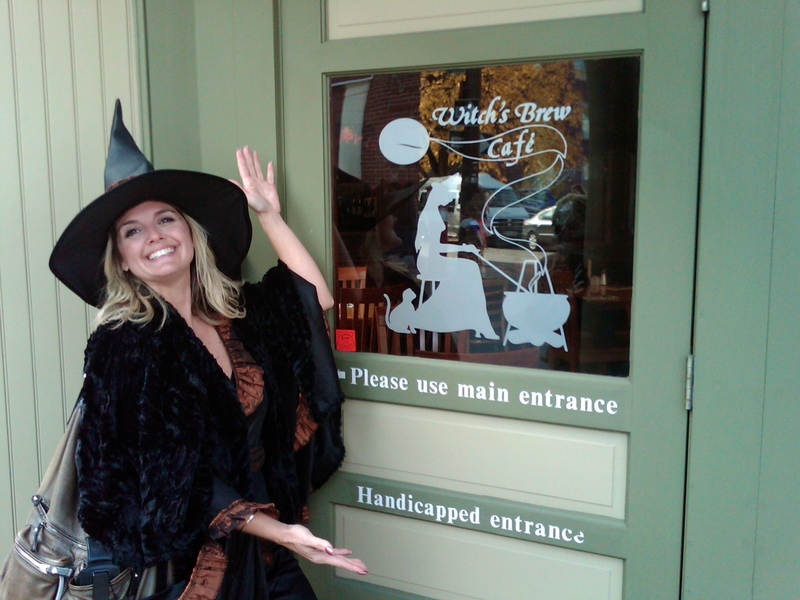 There really is no better place to celebrate Halloween than in Salem, and if you are in driving distance, you really should put this destination on your “Must See and Do” list for at least once! In my case it is on my list for many more Halloween’s to come! Planning is key to make this a fun time for you and your family, so check out www.haunted happenings.org or like them on Facebook. You can even text SALEM to 72727 for updates! See you in Salem on Halloween and don’t forget to wear your scariest costume! One of my favorite things to do is celebrate true meanings of holidays. 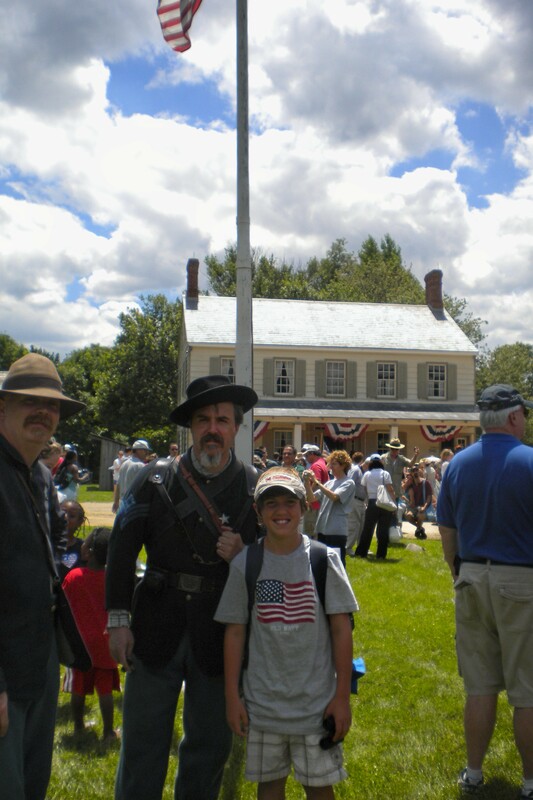 The Old Bethpage Village Restoration, located on Long Island, NY is a recreation of a 19th-century village. This living museum is a smaller scale Colonial Williamsburg or Old Sturbridge Village. With that said there is not as many live demonstrations, but you do receive more individualized attention since the crowds are smaller. 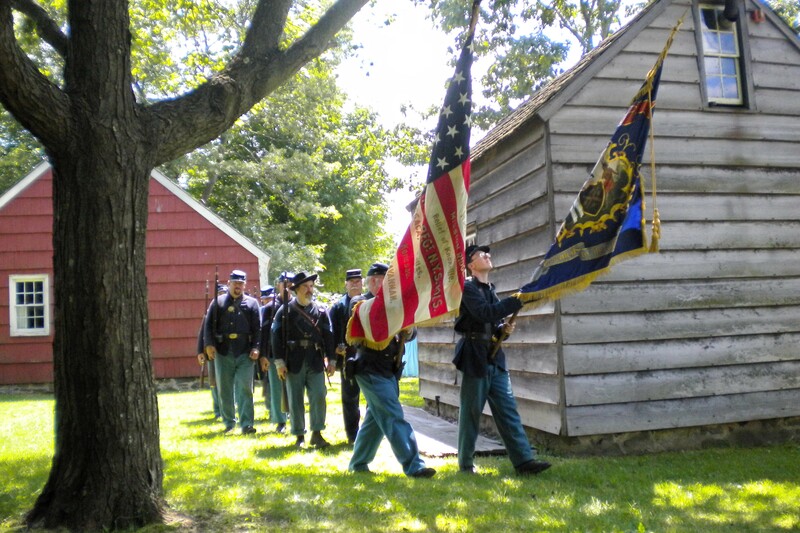 This living museum host many events through the year, one being an Independence Day celebration set in 1865, so we decided to do something a little different on the 4th of July and took a step back in time to the explore the past. The day was filled with fun events like the reading of the Declaration of Independence, a brass band concert, and a parade. There was also Civil War military drills celebrating our country’s 89th Independence Day. The actors were great , taking pictures with my son and answering his questions. You can enjoy your own picnic lunch and attend the “Temperance Society Picnic” which is behind the Noon Inn while listening to fiddle music. If you are in the mood for a cold cider, you can pick one up in the Noon Inn along with some pretzels. Another fun thing to do is watch a 1860 period All Star Baseball game. The game is a recreation of League Baseball Clubs that were held in Brooklyn and Queens in the 1800s. My son really enjoyed learning how much the game of baseball has changed. He revealed how grateful he was that his Little League uniform doesn’t have long sleeves and is not made of wool. We had so much fun spending the day back in time celebrating the 4th of July. We visited many different types of homes, a school, a church, stores and the farm. Each building had someone to share information about the history and the actors were in period costumes. We really enjoyed the farm and learned about the farming skills from years ago. There were several animals on the farm like sheep, cows and hogs. The hogs really seemed to be having fun in the mud. This is a fun family outing that only cost $10 for adults and $5 for kids. Just keep in mind that the village is set on 209 acres, so there is a lot of walking. Most of is flat, but there are a few hills. Also, make sure you pack some water in those picnic baskets because there was no air conditioners in those 19th century buildings! I know the 4th of July is usually reserved for barbecues and beach days, but doing something in the true spirit to celebrate our nations birthday really turned out to be a better than expected experience and was also educational. I definitely think this is worth the visit and believe you will be singing “God Bless America” upon your departure! Every year in Sleepy Hollow, New York, Washington Irving’s classic tale, The Legend of Sleepy Hollow comes alive. The event takes place the last four weekends of October. This is a popular event, so it is helpful to purchase tickets ahead of time online at www.hudsonvalley.org. 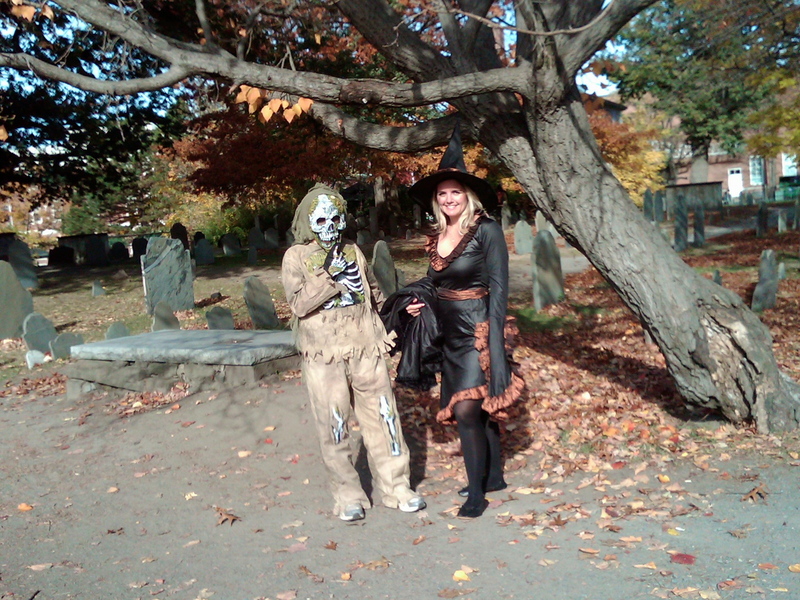 There are several events in Sleepy Hollow that makes celebrating Halloween spooky and fun. In the daytime there is a festival called the Legend Celebration. The Great Jack O’Lantern Blaze, with its illuminated 4,000 hand-carved pumpkins is also very popular, and we were unable to purchase tickets weeks in advance. 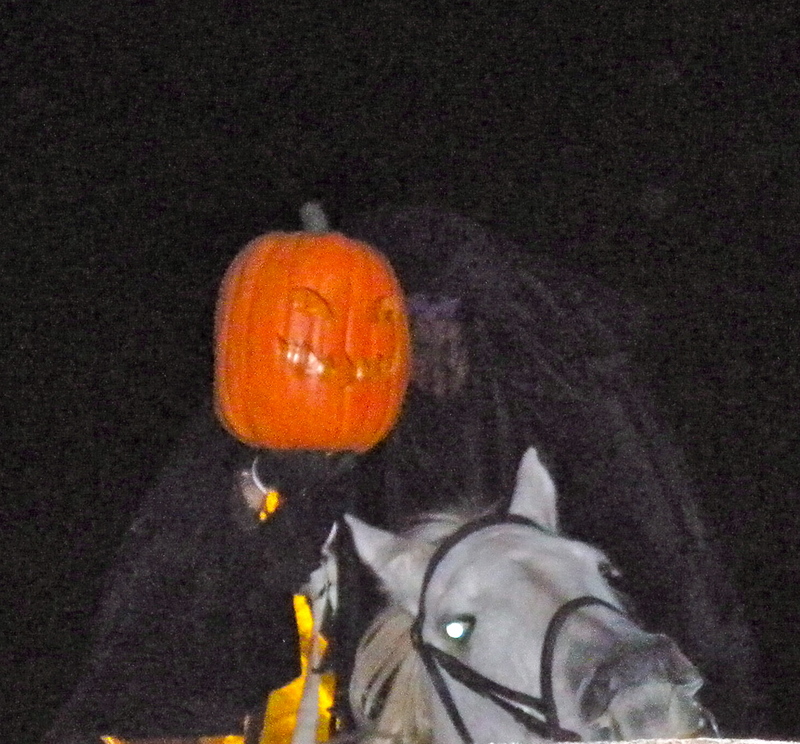 Irving’s Legend is where you can experience the Headless Horseman terrorizing Ichabod Crane. The daytime event, Legend Celebration is perfect for younger children and they can be entertained by live music, magicians and games. For literature enthusiast, a tour of Washington Irving’s home is available. 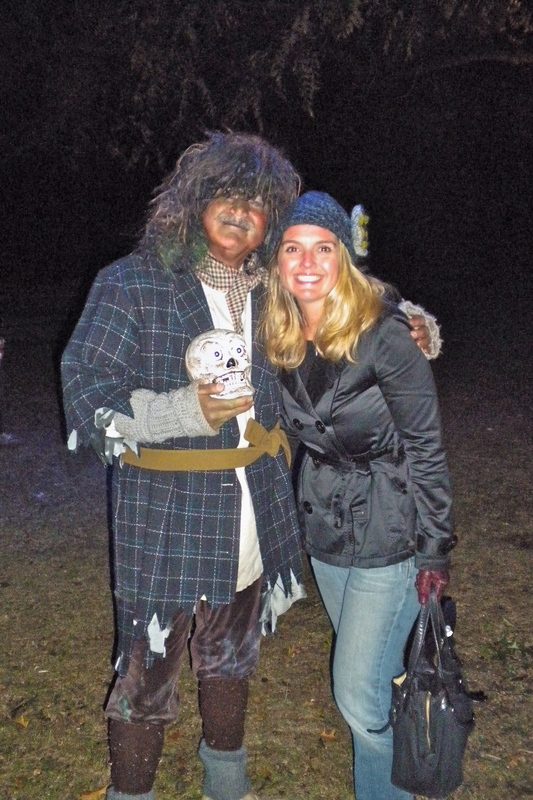 century farm and gristmill is turned into haunted area with the cast of characters from Irving’s tale roaming the area. The grounds are lit by candle lanterns and bonfires to give it a ghostly feel. 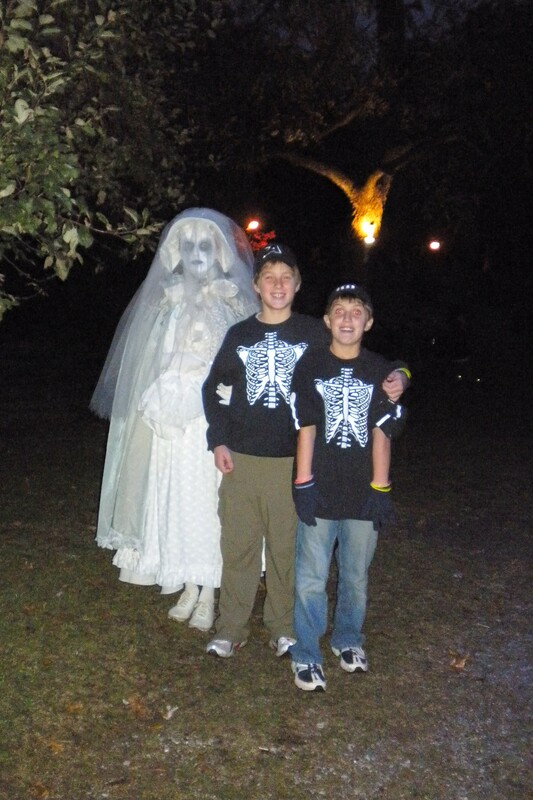 The boys who wore their skeleton shirts fit in with many of the other visitors in costume. We watched Washington Irving’s Headless Horseman take his fabled ride on a black steed and ran into witches, pirates, and spooky ghost. Listening to the rendition of “The Legend of Sleepy Hollow” allowed the boys to experience a classic tale in a way that couldn’t be done in the pages of a book. This was such a fun and different way to spend Halloween! The characters and re-enactments were great and it was an exciting way to introduce one of the “classics” to my son and his friend. If you are looking for another option to celebrate Halloween, this is a great alternative than the local haunted house. Just make sure you plan this day trip well in advance! Happy Haunting!